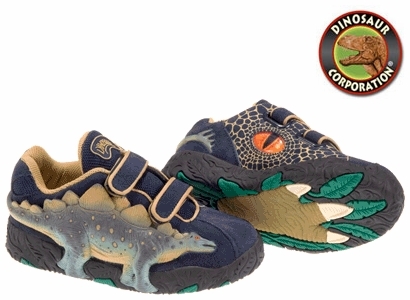 Dinosoles, the State of the Art Dinosaur Shoes! Stegosaurus sneakers are perfect for dinosaur enthusiasts. * Durable suede and leather upper withstands daily wear and tear. * 3-D dinosaur applique offers prehistoric flair. * Light-up design provides extra safety and fun. * Velcro straps secure the perfect fit. * Padded collar, tongue and footbed ensure complete comfort. * Rubber outsole gives him reliable traction.